Aloha! I have personally never been to Hawaii (poor me!) but I do love a luau! Tiffany from Fizzy Party is with us today to share some her pictures and ideas from her Annual Tiki Party. Every year she changes it up a little to keep it new and fresh and no one wants to miss it! Tiffany loves theme parties and carries it throughout the house. 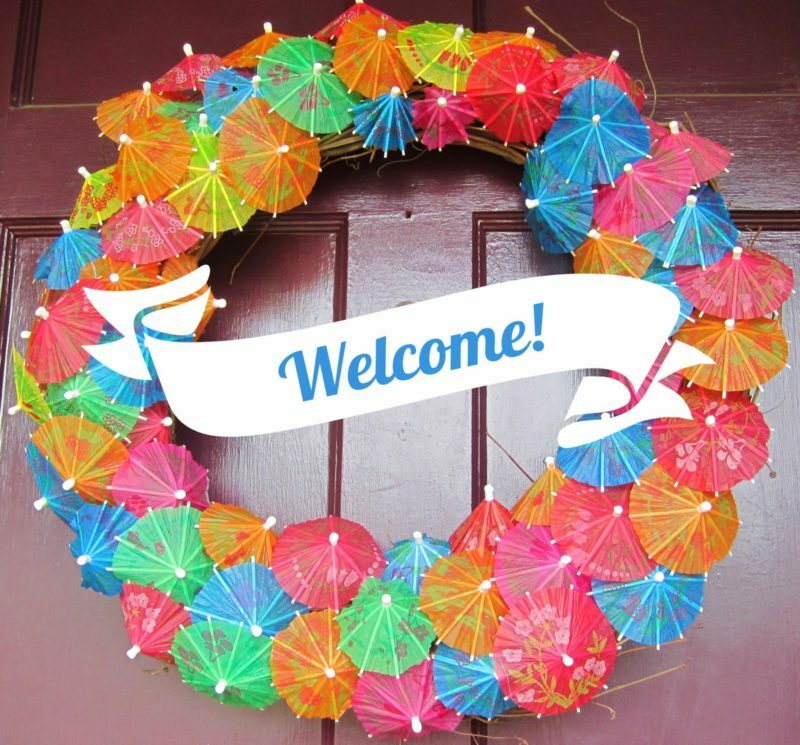 She believes the entry sets the party tone and her guests are welcomed by decorated tiki torches and a cocktail umbrella wreath. She saw this wreath in a magazine and had to give it a try. Tiffany swears it’s easy and it is certainly fun and festive. Tiffany’s Annual Tiki is always potluck and her friends go all out and try to bring tropical or Hawaiian dishes. She made Spam skewers with pineapple and wasn’t sure how they would go over. They were a huge hit and quickly realized she didn’t make enough. I bet there will be a much bigger tray this year! Tiffany has some great tiki party ideas. Fun fact: Spam is so popular in Hawaii that it has been nicknamed “Hawaiian steak” and is served at McDonald’s and Burger King. If you are in Waikiki in April you can catch the Annual Spam Jam…Spam is no joke in Hawaii! Fruit is always a great idea at a summer party so Tiffany made sure to have a lovely selection of tropical fruit including pineapple, mango, kiwi, grapes, and watermelon. Coconut ice cream in coconut bowls helped cool people off towards the end of the party and of course was topped with a tropical umbrella. No party of hers is complete without cupcakes. She made Strawberry Daquiri and Pina Colada cupcakes. You can find those recipes in one of her go-to cookbooks: The Big Book of Cupcakes . Thank you, Tiffany, for sharing your party with us! Can’t wait to see the party this year! If you would like to get in touch with Tiffany you can find her tiffany.fizzyparty@gmail.com, Facebook, and her blog.